Silva-Calvacanti, J. S & Costa, M. F. Fisheries of Anomalocardia brasiliana in Tropical Estuaries. Pan-American Journal of Aquatic Sciences, 6(2): 86-99. Download PDF file (487 Kb). Cervantes-Hern�ndez, P. & Gracia Gasca, A. Analysis of the mortality for the pink shrimp Farfantepenaeus duorarum (Decapoda, Dendrobranchiata) from Campeche Bank, M�xico. Pan-American Journal of Aquatic Sciences, 6(2): 100-108. Download PDF file (379 Kb). Santos, T. C. A., Gomes, V., Passos, M. J. A. C. R., Rocha, A. J. S., Salaroli, R. B. & Van Ngan, P. Histopathological alterations in gills of juvenile Florida pompano Trachinotus carolinus (Perciformes, Carangidae) following sublethal acute and chronic exposure to naphthalene. Pan-American Journal of Aquatic Sciences, 6(2): 109-120. Download PDF file (619 Kb). Rangel, M. S., Tagliafico, A., Mendoza, J., Freites, L., Silva, J., V�squez, A. & Garc�a, N. Population, reproductive and ecological aspects of the music volute Voluta musica (Caenogastropoda: Volutidae) in northeastern Venezuela. 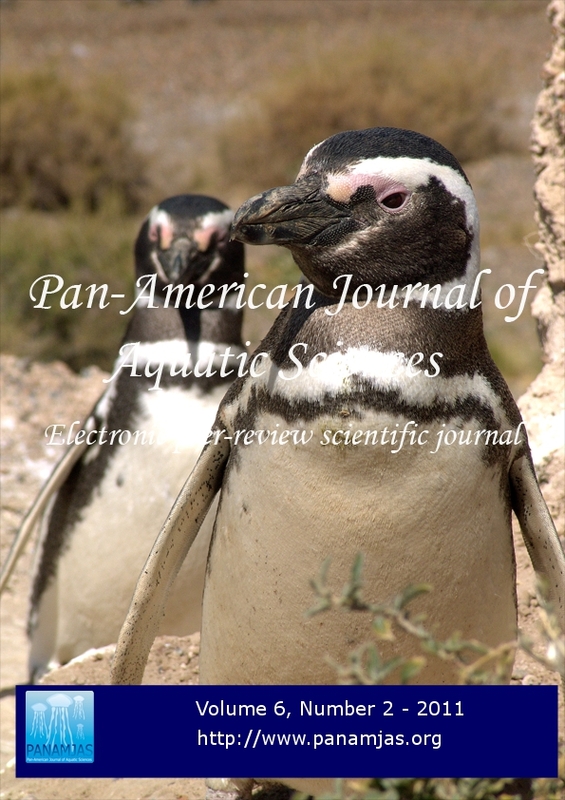 Pan-American Journal of Aquatic Sciences, 6(2): 121-137. Download PDF file (1,381 Kb). Oliveira, M. F., Costa, E. F. C., Freire, F. A. M., Oliveira, J. E. L. & Luchiari, A. C. Some aspects of the biology of white mullet, Mugil curema (Osteichthyes, Mugilidae), in the northeastern region, Brazil. Pan-American Journal of Aquatic Sciences, 6(2): 138-147. Download PDF file (554 Kb). Arocena, R. & Rodriguez, L. Small-scale structure of macrophytes and macrobenthos in coastal �Laguna de Rocha�. Pan-American Journal of Aquatic Sciences, 6(2): 148-160. Download PDF file (420 Kb). Rodrigues, F. L. & Bemvenuti, M. A. Diet and feeding strategy of the silverside Odontesthes bonariensis (Valenciennes 1835) (Atheriniformes: Atherinopsidae) from the Mirim Lagoon, Rio Grande do Sul, Brazil. Pan-American Journal of Aquatic Sciences, 6(2): 161-169. Download PDF file (524 Kb). Rodrigues-Filho, J. L., Branco, J. O., Peret, A. C., Decker, F. K., Luiz, T. F. & Verani, J. R. Impacts of the seabob shrimp fishery on Stellifer spp. (Perciformes, Sciaenidae) assemblage in Arma��o do Itapocoroy, Penha (SC), Brazil. Pan-American Journal of Aquatic Sciences, 6(2): 170-184. Download PDF file (351 Kb). Mansur, L. E. First record of partial albinism in the temperate rocky reefs fish Acanthistius patachonicus (Insertae sedis) off Southwestern Atlantic Ocean. Pan-American Journal of Aquatic Sciences, 6(2): 185-187. Download PDF file (214 Kb). Aura, C. M., Munga, C. N., Kimani, E., Manyala, J. O. & Musa, S. Length - Weight Relationships for Nine Deep Sea Fish Species off the Kenyan Coast. Pan-American Journal of Aquatic Sciences, 6(2): 188-192. Download PDF file (323 Kb).